Box and Pan Brakes, Foot Shears and Slip Rollers are essential machines to have when working with sheet metal. Box and pan brakes get their name from their ability to bend metal at sharp angles and create box or pan shapes. Cutting a long piece of sheet metal by hand can be a laborious task, and it's difficult to keep the cut straight and accurate. Foot shears make one clean cut across the sheet with just the press of a pedal. Slip rollers or "slip rolls" bend metal into curved bends and shapes, as opposed to creasing or cutting the material. We also carry a shear/brake/roll combination machine that offers the functionality of all 3 machines in one space saving and cost effective unit. 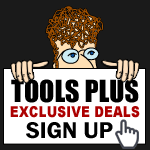 Box and Pan Brakes, Foot Shears and Slip Rollers are just one of the many categories of Metalworking Machinery offered at Tools-Plus.com.